Isaac Newton produced many well-known works in math, astronomy, and physics, but he produced about as many unpublished works which dealt with theology, alchemy, and the occult. This discovery was publicized by the then owner of the manuscripts economist John Maynard Keynes. After purchasing the manuscripts in a 1936 auction, and then studying Newton’s unpublished works, in 1942 Keynes wrote his new impressions of the famous “Father of modern Science” in a paper (apparently meant to be a speech) Newton, the Man. In his paper, Keynes called Newton “the last of the magicians” and he isn’t exactly wrong. Newton’s unpublished works explore chronology (applying meaning to numbers), alchemy, and Biblical interpretation (especially related to the Apocalypse). Newton was looking for cryptographic codes in ancient texts in the same way that he looked for codes in the natural world to help explain gravity, motion, and light. Some think Newton’s scientific work may have been of lesser personal importance to him, as he placed emphasis on rediscovering the occult wisdom of the ancients. In this sense, some believe that any reference to a “Newtonian Worldview” as being purely mechanical in nature is somewhat inaccurate. Below we retell some highlights of the story that Keynes told us, see Keynes’s Newton, the Man for more of the story in Keynes’s own words, or see Newton’s unpublished manuscripts for yourself. FACT: Keynes re-donated the alchemical papers to Cambridge in 1946 to allow others to study the works. Full Docmentary – Secret Life of Isaac Newton – Full Documentaries Films. The story of Keynes and Newton’s unpublished manuscripts. Keynes’s Newton, the Man, tells a wild and short story of the Newton he came to know after reading Newton’s unpublished manuscripts. Here are a few highlights to help you better understand Newton like Keynes did. Newton had a nervous breakdown sometime in 1693 after writing his masterwork Philosophiæ Naturalis Principia Mathematica (the Mathematic Principles of Natural Philosophy AKA Natural Science commonly called Principia) which he first published in 1687. In Principia Newton published his invention of calculus, along with the laws of gravity and motion which calculus helps explain (Yes, Newton developed a branch of mathematics to explain his theories which sat in his head and went unpublished for decades). Interestingly Principia was spurred on in part by a request from his friend Halley (of Halley’s Comet), one of Newton’s many famous friends. When Halley wanted to know how Newton knew gravity resulted in an elliptical orbit asking, “How do you know”? Newton said, “I’ve always known.” He translated his proof from calculus to Euclidean mathematics some time later, as he had not published calculus at that time. Calculus wasn’t the only idea Newton kept to himself, he spent nearly as much time looking for cryptographic messages in old Bibles as he did thinking about light (even learning new languages in order to read old Bibles). Newton was secretly an Arian (meaning he didn’t believe in the Trinity, which was heresy in his time, not that he believed in an Aryan race) and had a sincere belief that God (the Father) was the only true God. He spent a great deal of time trying to disprove the theory of the Trinity (Father, Son, and Holy Ghost) which his Contemporary Catholics favored. It was this private belief that prevented him from gaining top ranks in the Royal Society, as only ministers could achieve the upper ranks. Isaac Newton The Trinity Notebooks. 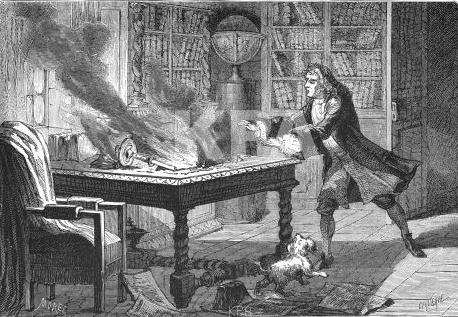 Newton also worked to perfect Alchemy and find the philosopher’s stone dedicating large portions of his life and writings to thought experiments and real experiments in this regard. One doesn’t even have to guess as to why Newton hid these beliefs and worked in secret often holding ideas in his photographic memory rather than on paper. William R. Newman on Why Did Isaac Newton Believe in Alchemy. Astrology, alchemy, element theory, these pseudosciences have been long replaced by chemistry and psychology and such, but in Newton’s day science and ancient knowledge were more entwined. One can’t forget the Newton poured through ancient texts looking for cryptographic codes when asking themselves “why did Newton believe in alchemy?”, but one also shouldn’t forget that part of alchemy and element theory become chemistry and part of astrology becomes astronomy. 19/42 Secret History: Leibniz the Optimist and Alchemy (vs. Isaac Newton’s science, Voltaire). After his breakdown, Newton made his shift from a physicist to an economist, and in this, he shifted away from his physics and math, and his theological and alchemic musings. He didn’t publish again until after his friend/rival (famous scientist and head of the Royal Society, where Newton was also a high ranking member) Robert Hooke died. Robert Hooke had tried to take credit for a few of Newton’s ideas (and partially rightly so, in the way Newton borrows from Galileo and Descartes, or borrows from Halley, he borrows from Hooke). Although there is proof of an exchange of ideas in the correspondence that Hooke and Newton had in which Newton acknowledges the influence, Newton rejected Hooke’s claim (and history agrees as it is Newton who offers what we still mostly today consider final proofs on gravity and motion). The Newton-Hooke rivalry is particularly unfortunate as Hooke was one of the best scientists of the time (with many inventions, discoveries, and advances in science to his name, including that in 1665, he inspired the use of microscopes for scientific exploration with his book, Micrographia). Ultimately Newton, who as noted outlived Hooke, helped history to bury the importance of Hooke and today, not even a portrait of Hooke remains. Robert Hooke Victim of Genius. Here is a look at England’s Leonardo Robert Hooke who Newton held an unfortunate grudge against. There are many more Newton stories. You can find them in the article Later life of Isaac Newton and in Keynes’s Newton, the Man, as well in Newton’s own work and the countless book published about the Father of Science Sir Isaac Newton. See our others stories on Newton including the story of his laws of motion and the story of Newton the economist.